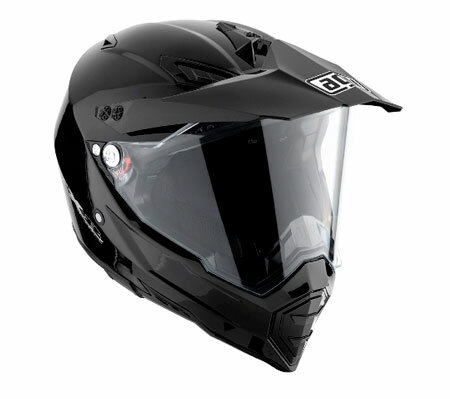 This thing is hot... it's really built off a true MX helmet, the AX-8. Then AGV just stuck a full shield on it. Last edited by Rail; April 21, 2011 at 08:32 PM.. I've been seriously considering one as well. I wish there were more choices than white, black and grey/silver though. That will definitely keep the branches from piercing through your mouth. Can that shield fold all the way up? The shield is removable so that you can wear MX goggles. It doesn't go up far enough to use goggles without taking it off. i konw right.. looks like my paintball masks..
Only took my first ride in it yesterday for like 30 min. Was very comfortable, my 58.5 cm head settled into the M shell (57-58 cm) quite comfortably after a few minutes. Faceshield very big, no optical weirdness, basically forgot it was there. No undue loudness imo. Noticed only a litle drag on the visor at higher speeds. Comes with chin skirt. I really like it. It'd be better if it had cutouts for my glasses but I am impressed, at least moving up from a scorpion exo-400.